Kathleen Zellner is an exoneration machine as she has 17 victories, mostly in Illinois. You need to know she is an expert at ferreting out police and prosecutorial misconduct. I would say she wrote the book on it. AS of a week ago, she is now Steven Avery’s defense co-counsel. The other new attorney for Avery is Midwest Innocence Project director Tricia Bushnell. Here she is media talking the Steven Avery case. You might say finding a neutral jury pool for a potential new Avery case may be hard to deliver. Anyway, she is doing a great job deconstructing the facts used by the prosecutors. What she says about forensics aiding the exoneration is just a glimpse on her future targeting of the prosecution’s case. She has been on Twitter blowing them into little pieces for the last week. @ZellnerLaw . Steven Avery’s lawyer has said that she has new evidence she believes will exonerate the man made famous by Netflix documentary Making A Murderer. Avery is the focus of Making A Murderer, the Netflix documentary which tells the story of his conviction for the murder of Teresa Halbach in 2005. Both and nephew Brendan Dassey are serving life sentences for the murder, having been convicted in 2007. Making A Murderer pays particular attention to perceived injustices in the case. Avery was the focus of a new episode of Dateline NBC on Friday (January 29). The series has featured an episode on Avery and his trial once before, back in 2006, but picked up on it again after the Netflix series became a hit at the start of the year. 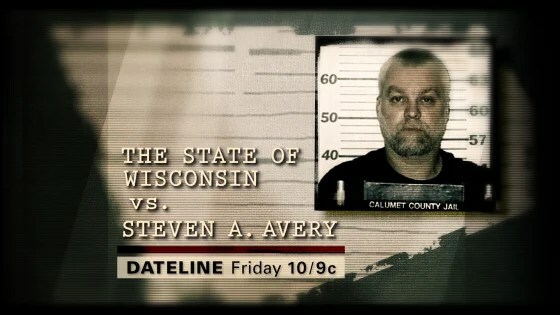 Among those interviewed in the Dateline special was Avery’s new lawyer, wrongful conviction specialist Kathleen Zellner. She revealed details of fresh forensic evidence which she says will prove Avery is innocent. Zellner also tweeted about her case, telling followers that she had taken news of the forensic evidence to Avery.